WASHINGTON (Reuters) - Republicans on Wednesday seized on the 50th anniversary of the "War on Poverty" to attack long-cherished Democratic social programs and roll out their own alternatives for fighting income inequality. 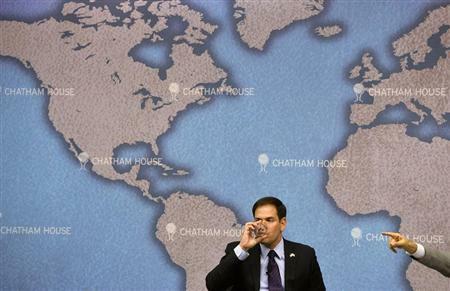 Republican Senator Marco Rubio, a potential 2016 White House contender, stood in the Lyndon B. Johnson room of the U.S. Capitol to criticize what he said were flawed Democratic big-government solutions dating back to Johnson's presidential tenure. "We have anti-poverty programs that help alleviate the pain of poverty, but they don't do nearly enough to help people overcome the causes of it," Rubio said, separately invoking the struggles of his parents who emigrated to the United States from Cuba. A lack of jobs was the chief cause he cited. Johnson declared an "unconditional war on poverty" in his 1964 State of the Union speech. He followed with legislation creating a series of new federal programs, including the Head Start early education program for toddlers, food assistance, and health insurance for the poor and elderly through Medicaid and Medicare. Rubio offered ideas such as shifting responsibility for many federal benefit programs to the states and providing a new form of federal aid, "wage enhancement," to low-income wage-earners designed to ensure that they make more money working than they might from receiving unemployment benefits. At a separate event, House of Representatives Republicans pushed a proposal to require people to work in exchange for food stamps. A party effort to toughen requirements for food-stamp eligibility has been challenged by Democrats, who say it would knock some people off the rolls and add to economic suffering at a time when many Americans are struggling. Rubio's charge that earlier ideas weren't helping the poor was picked up by Florida Republican Representative Steve Southerland, who is leading an initiative on poverty for the Republican Study Committee, a large bloc of House conservatives: "While (the war on poverty) may have been launched with the best of intentions, it's clear we are now engaged in a battle of attrition that has left more Americans in poverty that at any other point in our nation's history." Democrats have been laying plans for months to focus their 2014 U.S. congressional agenda on narrowing the gap between the rich and poor, and President Barack Obama intends to make the theme central to his State of the Union address on January 28. Michael Czin, press secretary for the Democratic National Committee, said that far from helping the poor, Republicans are intent on "shredding" social safety net programs. He cited Republican resistance to Democratic proposals such as extending federal unemployment benefits and raising the minimum wage. House Budget Committee Chairman Paul Ryan, a former vice presidential candidate and another potential 2016 Republican presidential contender, has also taken up the issue of poverty. Ryan has been visiting poor neighborhoods and meeting with advisers to shape an anti-poverty program he will publicize later this year. Ryan will be interviewed about the subject on Thursday by NBC and is scheduled to speak at the Brookings Institution think tank next Monday on the topic of social mobility. The Republican pivot comes at the start of a year in which the party aspires to wrest control of the U.S. Senate from Democrats in the November congressional elections and to boost its majorities in the House of Representatives by crying up the problem-plagued rollout of Obamacare. Prominent Republicans have worried since the 2012 defeat of Republican presidential candidate Mitt Romney about the need to avoid the appearance of not caring about the poor and the middle class, a portrayal Democrats have encouraged since the Johnson era. Romney sealed that image during the campaign when he disparaged the "47 percent" of U.S. households he described as living off government handouts. Most recently, Obama and Democrats in Congress have made much out of Republican resistance to raising the minimum wage and extending unemployment benefits. "What Paul Ryan and others are trying to do is undo decades of stereotypes that are associated with the political parties. And that's just a really tough battle," said George Washington University political scientist John Sides. "I think there's been something of an indifference among the Republican party and the conservative movement to the poor. I think that's been a moral failure, and I think it has had negative political ramifications," said Peter Wehner, a scholar at the Ethics and Public Policy Center in Washington and a former aide to Republican President George W. Bush. If Republicans want to make headway in changing perceptions, Wehner said, it will be crucial for them to flesh out their ideas on fighting poverty with concrete details in the coming months. "Rhetoric alone won't do it," he said, "but serious policies will."